When I first started thinking about food and cities many years ago I documented my initial thoughts in ‘A Table in Space’ (Parham, 1990). The title referred to sharing food at the table – including public feasts. In my conception of this public dining, the table in space was the shared table of commensality and the space was not only of the table itself but its relationship to the outdoor rooms of the town. I reflected in that paper on the intriguing, and to my mind elemental, way that people will take over streets for dining, as in the Palio contrade dinners or in the religious and political festivals of many Italian, Spanish and other towns. I posited that these events ‘from below’ contrasted to the pompous or exclusionary practices of Royal fêtes, state dinners and municipal banquets staged as expressions of civic power. Surely, I argued, the anarchic practices of feasting as examples of public dining were all about conviviality: representing a sense of solidarity and connection to people and place symbolised by, and given material expression through, eating together publically. This was the opposite of an instrumental attitude to food where exchange between people was commodified. And it wasn’t just the public eating that mattered, but the growing, preparing, cooking and serving food to others that said something positive about the essential sociability that could be nurtured as part of the human condition. Moreover, I argued, this public dining didn’t just happen anywhere but was made possible by and in turn helped make cities in the way it celebrated public space over private power. I was fascinated about how place design contributed to and even facilitated how people would eat together in public. Did the presence of a table or a table like structure matter? Did the height-to- width ratio of the space need to be in a certain range to make an outdoor room? Were there other designed elements that went into creating a desirable eating atmosphere? Were certain places – often those developed before 20th modernism – better configured to provide space for such a feast than the food spaces produced by much of our contemporary placemaking? Thinking about these public feast ideas brings to mind Charles Fourier (1772-1837), the French philosopher who proposed a new settlement type based on the tenets of the French Revolution, where liberty, equality and fraternity would be lived out in a utopian society of Harmony within Phalanstèrie: the built component of co-operative agricultural communities he dubbed phalanxes. Illustrations by Charles-François Daubigny show the Phalanstèrie as an enormous sprawling town- like structure designed in grand classical style and situated in a sylvan rural setting. Fourier was very specific in his writings about what landscapes would work in agricultural and climatic terms as a context for each phalanx. 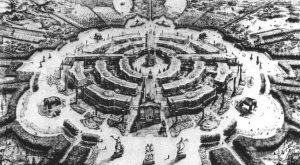 These spaces would provide communities of around 1600 people with a kind of elaborate commune in which work and domestic labour would be shared, love would be free, women would be equal, children’s tastes and abilities would be nurtured, and socialised food production and consumption would be an expression of egalitarianism. Linked to his place ideas, Fourier developed the philosophy of gastrosophy as a counterpoint – and a riposte – to the burgeoning art and science of gastronomy, which he decried as bourgeois, market led, and thus essentially wrong. Gastrosophy according to Fourier was a sociable approach to food that ‘encapsulated a complete understanding of food production, cookery, and health, using all of these to make the world a better place by pleasurably and harmlessly realizing one’s own desires and sharing them with others’ (Levi, 2015: 41). In developing this comprehensive food doctrine, Fourier ‘devoted a large part of his writings on food to the necessity to teach adults and children how to taste food, cook, sew, reap and preserve; his idea was to transform people into gastrosophers’ (Fleurot, 2017: 65). Fourier’s own utopian food proposals, though, were never realised in actual human settlements – apparently he sat in Paris cafes for many years unsuccessfully trying to woo investors with insights including how children’s natural affinity with dirt could be used to good effect – but despite this lack of built examples, Fourier has richly influenced our understanding of both place and food. Fourier thought that in his world of Harmony the multitude should eat well and copiously, not just the ‘gastrolatrous’. ‘These highly active people would be eating five times a day a great variety of pure, high quality, light foodstuffs – mainly fruit, vegetables and chicken’ (Fleurot, 2017: 67), with the lower class ones working up over time (as their digestion accelerated) to their five meals with four snacks in between (Levi, 2015: 50). Fourier intended that the higher class Harmonians would stage banquets for their more modest companions a number of times a year so it seems to me that we might expect he would approve of proposing such Harmonian inspired feasting. I wondered what a public feast in keeping with Fourier’s philosophy of gastrosophy might be like? And what food should be included in this feast? Clearly the process of producing such a Fourierist feast would need to reflect the principles of gastrosophy: showcasing its branches of gastronomy, cooking, preserving, and farming. In Fourier’s ideal society Harmonians would learn to become skilled in all these aspects of gastrosophy so any feast could be expected to highlight that they had grown the food, cooked or preserved it and were tasting and eating it in an informed way. The feast might be spontaneous in an immediate sense but framed by the long term development of Harmonians who had been trained since childhood (Fourier had plenty to say about training children’s tastes and appetites in highly sophisticated ways) in understanding, cultivating, preserving and cooking good food for themselves and others. In an ideal situation the feast would occur in the public space of the Phalanastèrie. Looking at Baubigny’s engravings I suggest a summer feast could be an outdoor event in the main square reached from the ceremonial avenue that leads to the Phalanx’s entrance. With large tables set up, perhaps shaded by a temporary pavilion of some kind. In colder weather it could be staged in the caravansary wing that was to house the assembly rooms, ballrooms, and dining halls envisaged by Fourier for the Phalanastèrie. Obviously the food would be prepared in the Phalanastèrie’s communal kitchens through socialised labour. Children would be starting their gastrosophical education in the very attractive kitchen and would help grade and shell the peas as Fourier proposed (Levi, 2015: 47). Specific foods and preserving methods are mentioned in various places in Fourier’s writing so I’d like at least some of those to feature. To start the feast would offer fresh radishes with butter and salt, as Fourier points out that even the most ordinary kinds of foods – like radishes and cabbages – can be excellent if produced where they can be grown to best advantage to be most delicious, and then eaten with a high degree of gastronomic refinement (an aim of gastrosophy). Then there might be some kind of composed salad using fresh leaves from the Phalanastèrie’s gardens, perhaps with walnuts from the nut trees they would surely cultivate and cheese from goats or sheep they would raise. Assuming we are not updating Fourier’s food to avoid meat based agriculture (and that might well be something to consider) these salads would be followed by a selection of poultry. The quails, pigeons and chickens (I am excluding larks) would be roasted by children according to their size in working the roasting spits, as Levi reports (2015:47). This course might include a casserole of chicken and herbs, which would make sense given Fourier’s expectation of chicken’s centrality to the Harmonian cuisine. To accompany the roasted birds and casserole, there would be the child- prepared peas of course, and there could perhaps be a potato gratin, rather than bread, which Fourier points out relies on grain production which he considers will require too hard labour to be a common crop in future. Both a casserole and gratin would be good for feeding a large group and can be served in big dishes at the table rather than plated as they might be in the dreaded haute cuisine of gastronomy. I’d punt for a dish like gratin dauphinois. And what about dessert? Fourier discussed the apple as an example of steep pricing caused by the commercial food system, so apples (grown and picked in the phalanx orchards, not bought) would need to feature in some form. Perhaps a series of fresh apples and apple compotes? Preserving peaches and good quality melon are mentioned by Fourier so why not dishes of preserved peaches and some excellent fresh melons too? As Levi (2015: 48) points out ‘In common with the rest of the population, the children should work with their tastes and thus be primarily involved in preparing their favorite foods: dishes such as sugared creams, compotes, cakes, jams, and fruits’. So a selection of these should help round off the feast: providing lightness and variety in line with Fourier’s principles. And who wouldn’t want to eat what Jane Levi reports as Fourier’s favourite cake, the apparently delicious puffed macaroon tart, the mirliton? The feasts might end with mirlitons that would be heaped up into towers along the feasting tables. And to drink? Fourier suggests replacing ‘civilised’ war with a huge international gastrosophical contest which would culminate with the winner (producer of the perfect dish) being saluted by the popping of hundreds of thousands of champagne corks (Levi, 2015), so let’s suppose champagne will be drunk throughout the feast. In reality I can imagine a feast that explores some of these Fourierist ideas in a public setting, and perhaps that might be an element built into the ongoing research to which this piece is a contribution? It seems to me that Fourier’s prescient, funny (but also very serious) ideas about food and place are well overdue wider consideration. Scholars like Jane Levi and Magali Fleurot referenced here are a great source for that work. I do hope we really can learn to feast in a way that would express Fourier’s principles and make places that help us become more like the gastrosophers he envisaged. Levi, Jane (2015) “Charles Fourier Versus the Gastronomes: The Contested Ground of Early Nineteenth Century Consumption and Taste.” Utopian Studies 26, no. 1 (2015): 41-57. Susan Parham works as the University of Hertfordshire’s Head of Urbanism and Planning at the School of Life and Medical Sciences (LMS) in the Geography, Environment and Agriculture group. In September 2015 Susan was appointed as Academic Director of the newly established International Garden Cities Institute (IGCI) in Letchworth as part of the University’s research partnership with the Letchworth Garden City Heritage Foundation. Her particular research interests include the urbanism of Garden Cities and New Towns, as well as food and spatial design, sprawl retrofitting and transport oriented, compact cities. Dr Parham also has ‘process’ expertise in engagement on planning, urban design amd urbanism issues. In 2015 Dr Parham completed a book for Bloomsbury entitled Food and Urbanism, delving into the interplay between food and place from the scale of the table to the region, while her 2012 book Market Place: Food Quarters, Design and Urban Renewal in London reported on primary research into food-centred regeneration processes that are transforming physical spaces and social practices in moribund market areas in contemporary London.